Existing building facing Carroll Creek Park. New YKK storefront system windows. New roof and trim. Inside main building lobby addition looking at existing brick walls with exposed structural steel and ductwork. 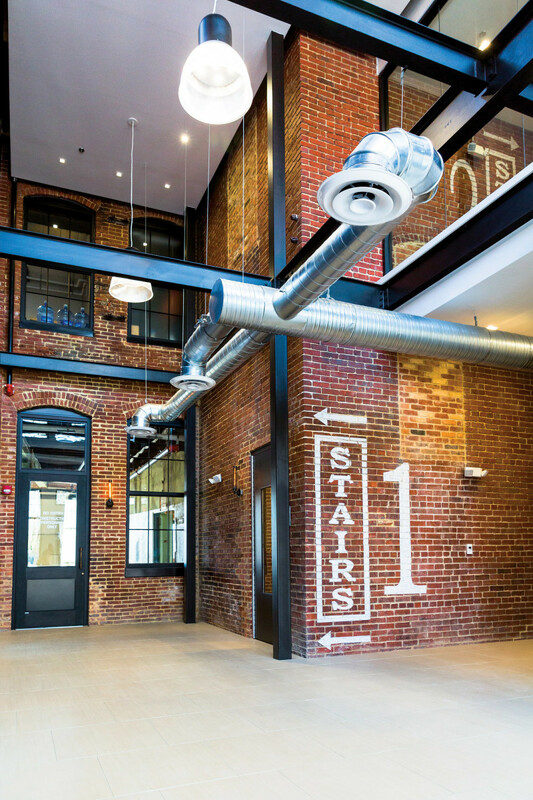 Existing window openings were kept and look from first- and second-floor tenant spaces into the two-story lobby. 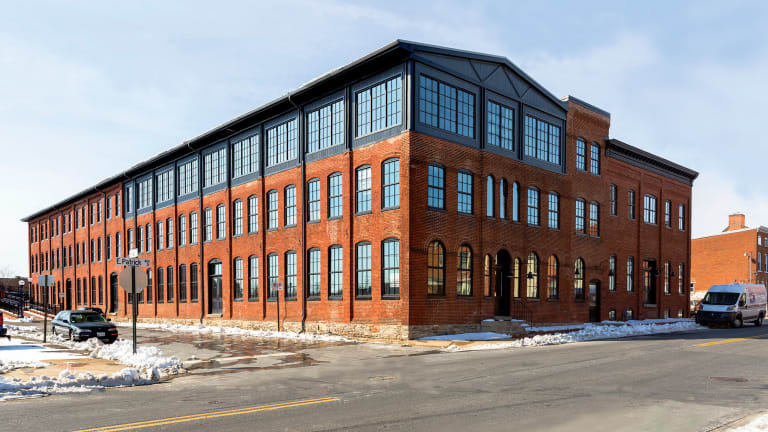 In a similar vein, GTM Architects worked with Douglas Development on the initial shell building restoration to see what might be made of the old mill. Later, software developer Yakabod became involved as a tenant once the shell was mostly complete. 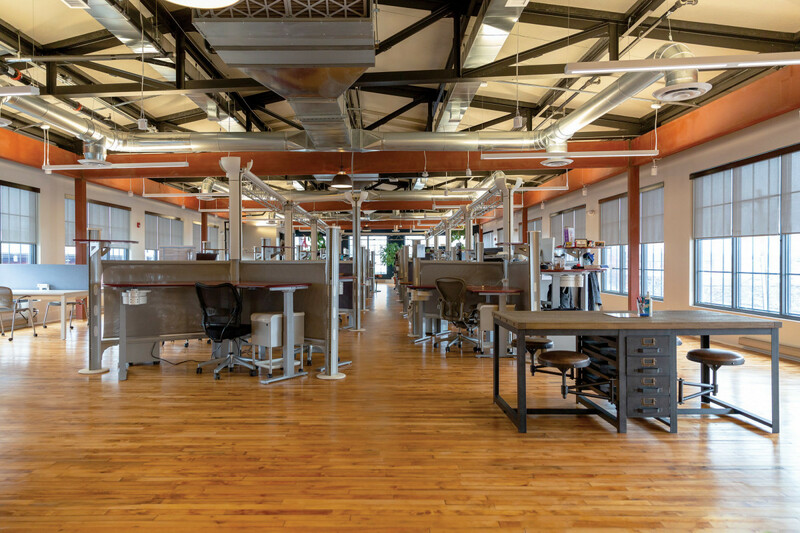 The ultimate goal was to “create a space that embraced the historic character of the building while adding modern elements and providing expansion areas to support the company as they grow.” Located between East Patrick Street and Carroll Creek Promenade, the 40-ft. by 210-ft. tenant space is a direct response to programmatic and adjacency challenges. The original main building dates to the 1890s, and was followed by a series of additions, the last of which was built in the 1960s. 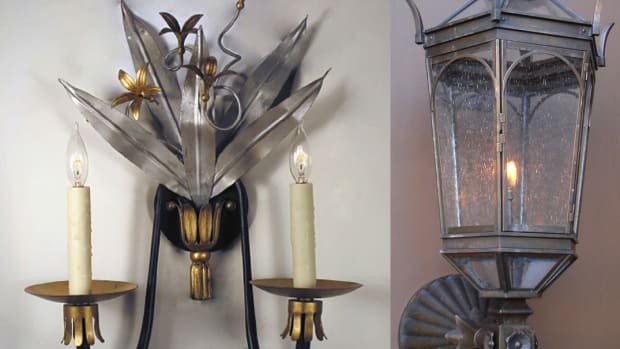 “It was constantly evolving for almost 100 years, and still is,” says Sheridan. Recalling the condition of the third floor, she adds: “It was condemned and torn down. Roofing paper had been thrown over the existing floor. 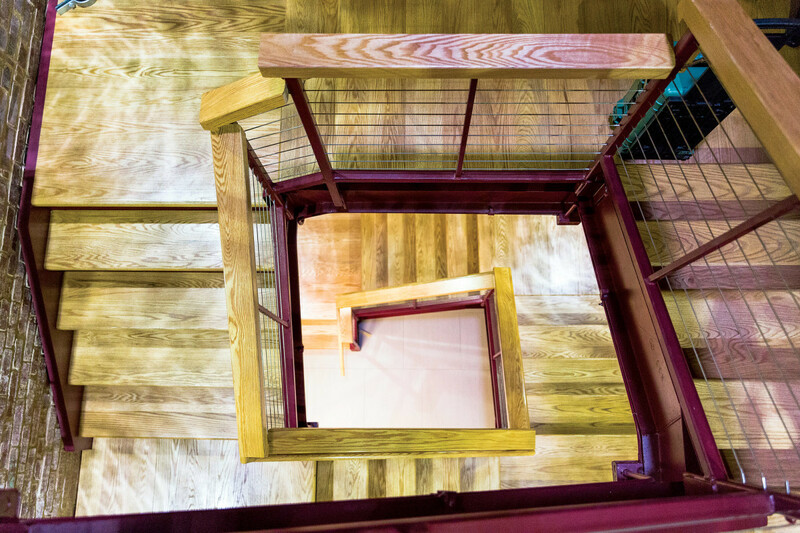 If you went up to what had been the roof and peeled back the paper, you could see the old hardwood floors, which were pretty damaged at that point.” Adding a new third floor that wouldn’t compromise the existing structure was an engineering feat. The solution was to run columns just inside the exterior walls down to grade to support the third floor, which means the addition is self-supporting. “If the first and second floor were to collapse, the third floor would remain standing,” Sheridan says, noting that no weight was added to the first and second floors—a strategy that helped to protect the existing building. New wood and steel egress stair in existing stair tower. Other portions of the building were questionable, too. 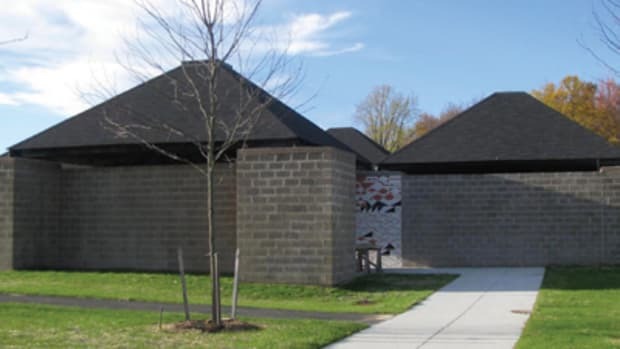 “There was one section that was in such disrepair that we documented it as best we could before tearing it down and starting over—using as much of the reclaimed brick as possible,” Sheridan explains. The team reinforced the original wood trusses with steel on the top floor, which worked to maintain the desired aesthetic. The trick there was to add insulation while keeping the trusses exposed. To do so, they used SIP panels on top of the roof—effectively creating a plywood sandwich with the insulation in between. To disguise the underside of the plywood, they used reclaimed boards to mimic what the original sheathing would have looked like. 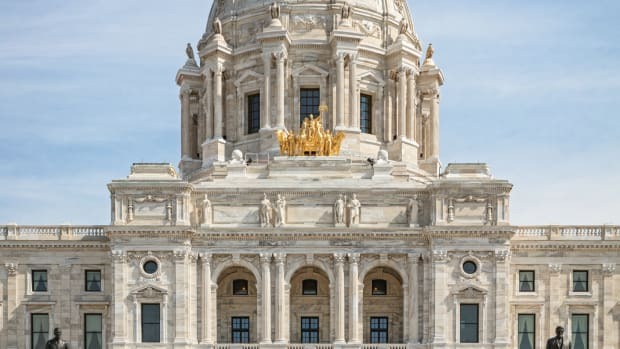 Because there was no distinct lobby and accessibility was severely limited, a central stair, elevators, and restrooms were added to the building core. 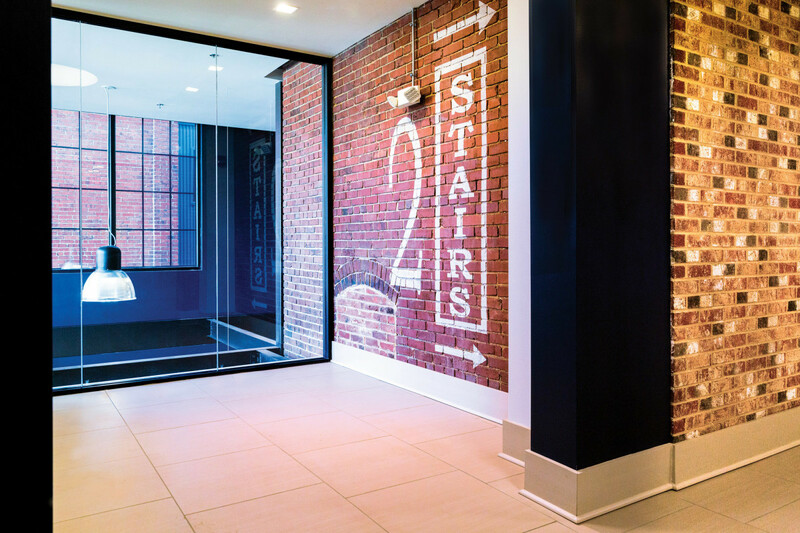 A small addition houses a new lobby and the main elevator; and an existing stairwell on the outside of the building was enclosed to serve as an interior stair. “That allowed us to connect the three floors off one central lobby and gave us better circulation and accessibility,” notes Sheridan. Other lifts were added to justify the malaligned floors that had been connected by awkward sets of stairs. Second floor elevator lobby looking towards two-story main lobby. Beyond that, the two tenant spaces were developed in accordance with their different needs. The second-floor tenant—Regent Education, Inc.—wanted a breezy, fresh feel but was contending with the potential for a “bowling alley aesthetic,” which can result when working with a long, narrow, columned space. 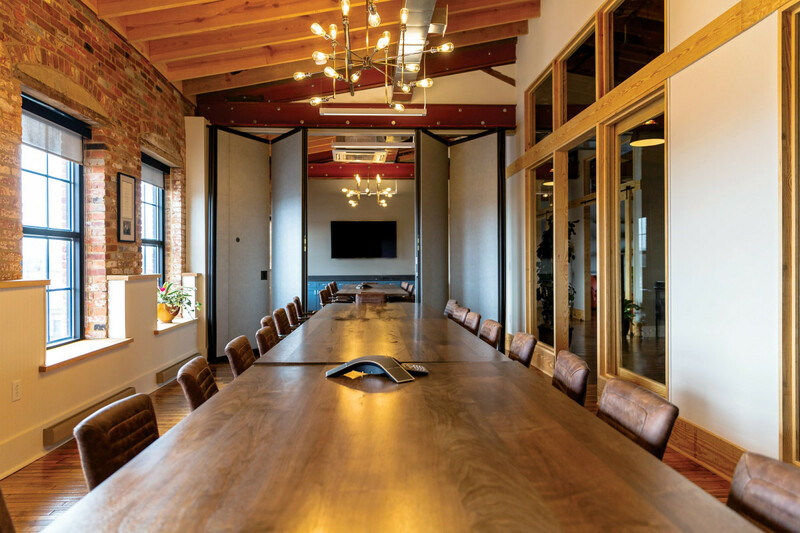 “We tried to load up the offices on one side and incorporate some open areas across from them in a staggered fashion,” explains Sheridan, adding that the integration of barn-style sliding doors also helped to break up the space. In Yakabod’s case, they were interested in open-concept workstations. 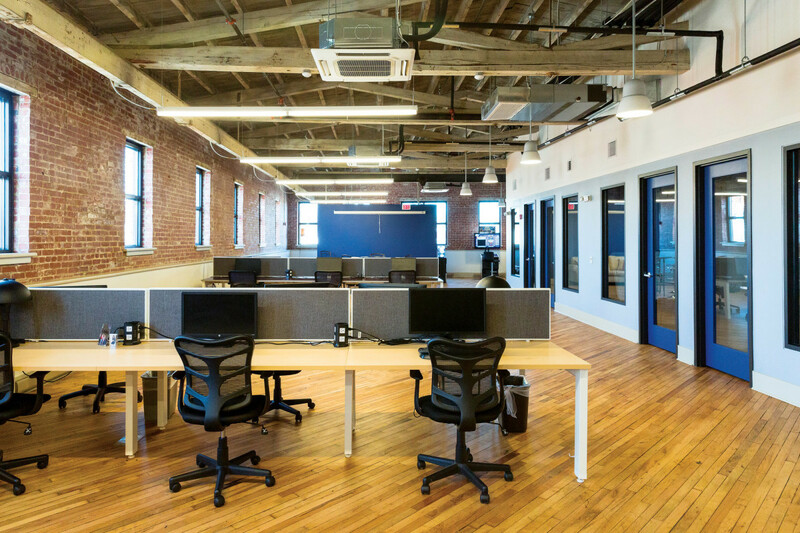 The third-floor addition has much larger window openings than the rest of the building, so GTM took advantage of all the glass by orienting the workstations toward the windows; those stations are centralized at the middle of the floor plan with circulation around the edges. The 4,000-sq.-ft. “glass box” half of the space creates the open, light, and flexible feel the company desired. Regent Education Inc. space (second floor) including open workstations and offices. Yakabod’s offices, two large conference rooms, and three “break-out” lounges are all organized within the original masonry-punched window-half of the historic building. The old windows were traditional double-hungs with pockets and weights. Others were replaced with a YKK system with insulated glass that mimics the double-hung look but are not operational. Coffee bar in Yakabod space designed around the structure for the old freight elevator. Because Yakabod’s former headquarters had been located in a fire station, they were familiar with the challenges that come with an old building. “This raw space was an opportunity to examine what did and didn’t work about their old space and what could we improve upon,” notes Sheridan. Of particular importance to the Yakabod team was a commercial kitchen and facilities to accommodate the potluck meals they enjoy regularly. Surplus electrical outlets were configured to be located outside the kitchen to accommodate a serving table, where everyone can plug in to warm dishes without tripping the circuits. 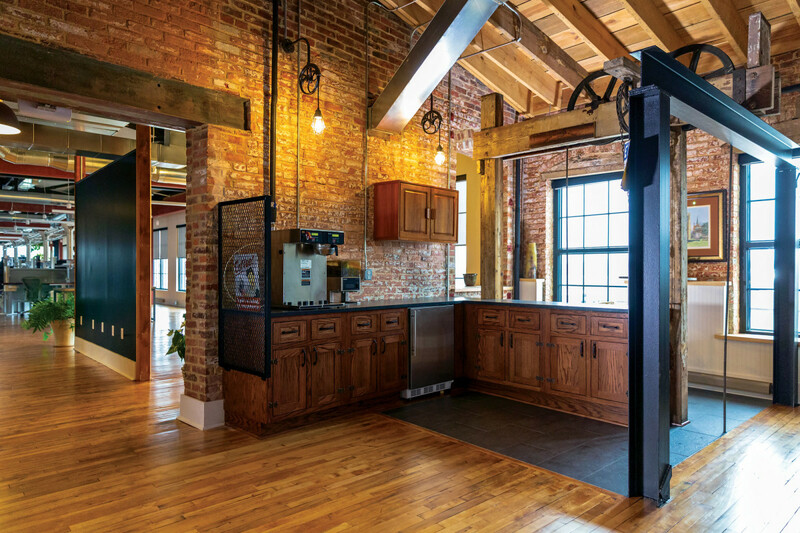 Adding to their culinary capabilities is a professional coffee bar housed around the original freight elevator structure. 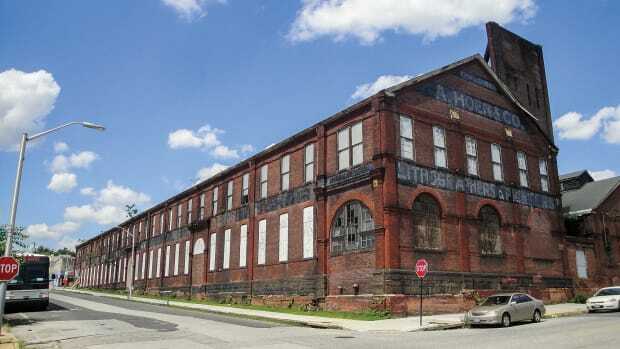 To maintain character of the original knitting mill, they left all wood structure unpainted and raw to expose all of the markings that have accrued over time. 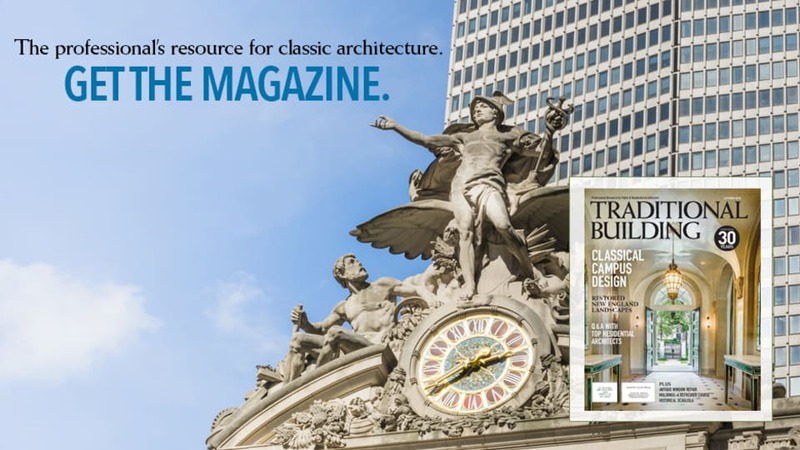 Sheridan notes a small detail with discernible impact: the existing glass transformers that were used for exterior electrical insulators in the courtyard were removed to re-point and clean the brick but saved and reinstalled for their aesthetic effect. 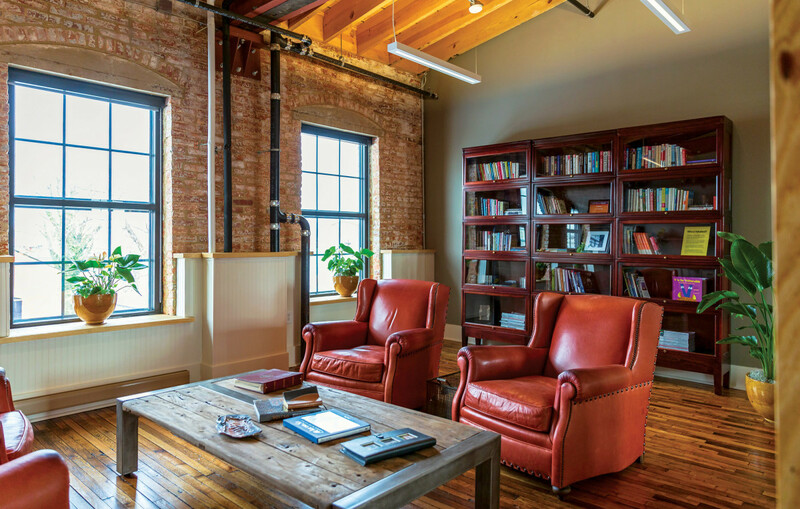 Of course, the exposed rafters, glass expanses, and reclaimed floors are in keeping with the old mill’s personality. Conference room in Yakabod space. Glass walls were added to bring light into the central corridor. And the project continues. The shell for the second phase—an L-shaped one-story section facing Carroll Creek Plaza—is currently under construction. Two tenants, a brewery and a deli, are confirmed. Other possibilities include a restaurant and/or a farmers’ market. 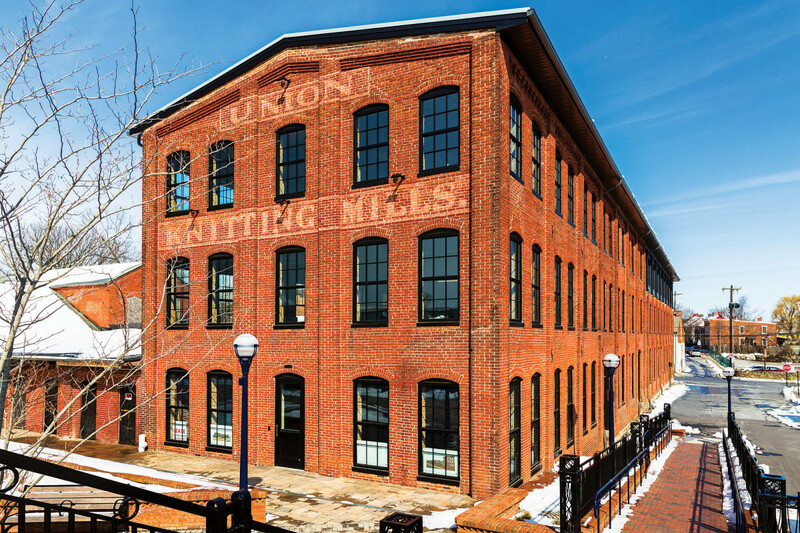 When today’s iteration of the Union Knitting Mills building is complete, it will surely knit together the professional community it houses. Inside third floor addition open work space. Exposed steel trusses and raw steel beams and columns.